Ramakrishna Mission Students’ Home, Mylapore, supports and educates 650 underprivileged students. The Polytechnic College started as an industrial school in 1925 has grown in to a full -fledged Polytechnic with good infrastructure facilities such as well-equipped laboratory and workshop facilities and a highly talented and experienced staff. Only orphan/destitute boys who have merit, but not the means to pursue further studies beyond 10th standard are admitted. All the boys receive an integrated education under the Gurukula system with stress on both character and technical competence in their chosen field, thereby enabling them to stand on their own legs. New equipments were required to upgrade the Polytechnic College, especially the Mechanical and Automobile courses. Rotary Club of Madras East (RI Dist 3230) as part of its Vocational Service Avenue provided two lathe machines and one four post hydraulic lift to the College. The total cost of Rs 6 Lakhs is being met out of the ‘Skilling India Initiative’ of Saurashtra Cement Ltd, a Gujarat based company. This was possible due to the efforts of Padmashri S V S Raghavan, Director, Saurashtra Cement. Nearly 200 students in each course will be benefitted through this new equipment. Padmashri S V S Raghavan, Director, Saurashtra Cement interacting with the students and faculty. Rtn Jayanthi Govindan, President, Rotary Club of Madras East, Swami Satyajnanananda, Secretary, RKM Students’ home along with other Rotarians are seen. 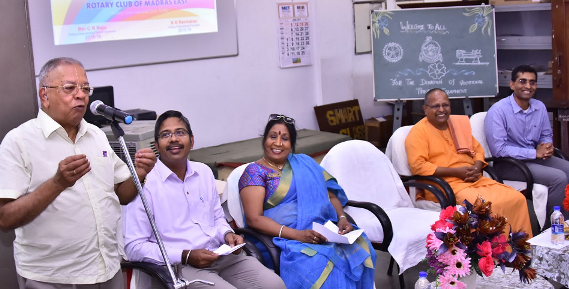 Rtn Jayanthi Govindan, President, Rotary Club of Madras East and Swami Satyajnanananda, Secretary, Ramakrishna Mission Students’ Home were also present during the function.